⇓The purpose of this European Respiratory Society/American Thoracic Society (ERS/ATS) Task Force position paper is to define the field of interventional pulmonology as well as to describe the minimal requirements in methodology and logistics, the indications, contraindications, outcome and training requirements for each interventional procedure. This position paper has been prepared by a group of European and North American experts. Schematic illustration of the three main types (a–c) of malignant central airway obstruction shown at the tracheal level, with identical degrees of narrowing of the lumen. a) intraluminal; b) extraluminal; c) mixed obstruction. Algorithm for the management of malignant central airway obstructions. Terms in hexagonal boxes are conditions; terms in rectangular boxes are procedures. Two-way arrows indicate the tendency of endobronchial tumours to recur and the repetitive need of multimodality treatment. Interrupted arrows: 1: rare cases of primarily inoperable lung cancers which become secondarily operable after initial therapeutic bronchoscopy usually followed by neo-adjuvant treatment; 2: rare cases of operated lung cancers initially presenting with central airway obstruction and still being operable after careful restaging of an endobronchial recurrence. TNM: tumour staging, including histology; CPR: cardiopulmonary reserves of the patient. Reproduced with permission from 81. Interventional pulmonology can be defined as “the art and science of medicine as related to the performance of diagnostic and invasive therapeutic procedures that require additional training and expertize beyond that required in a standard pulmonary medicine training programme”. Disease processes encompassed within this discipline include complex airway management problems, benign and malignant central airway obstruction, pleural diseases, and pulmonary vascular procedures. Diagnostic and therapeutic procedures pertaining to these areas include, but are not limited to, rigid bronchoscopy, transbronchial needle aspiration, autofluorescence bronchoscopy, endobronchial ultrasound, transthoracic needle aspiration and biopsy, laser bronchoscopy, endobronchial electrosurgery, argon-plasma coagulation, cryotherapy, airway stent insertion, balloon bronchoplasty and dilatation techniques, endobronchial radiation (brachytherapy), photodynamic therapy, percutaneous dilatational tracheotomy, transtracheal oxygen catheter insertion, medical thoracoscopy, and imaging-guided thoracic interventions. The latter two topics are not dealt with in this paper, as they have recently been covered by extensive reviews elsewhere in this journal 1, 2. In order to perform an interventional procedure, a well-equipped facility, trained personnel, preprocedure evaluation, and monitoring are mandatory. The suite should be accessible for a stretcher or bed, and the examination table should be accessible from all sides. Dimming of daylight is essential. The size of the suite and placement of the equipment should allow for minimum interference between the bronchoscopist, anaesthesiologist, and nursing personnel. To enhance cooperation, it is recommended that procedures be performed under video observation. Certain procedures may have to be performed in an operating room (see later). The suite should be equipped with cardiorespiratory monitoring and resuscitation equipment. Patients should undergo preparation and recovery in a separate room that is equipped with an oxygen supply, vacuum suction, and adequate monitoring. The bronchoscopist, anaesthesiologist, and nursing staff should have appropriate training for the procedure to be performed. The anaesthesiologist should be proficient with conventional, jet, and single-lung ventilation. All personnel should perform the procedures frequently enough to maintain their competence. For interventional procedures, at least one to two nursing assistants are needed. If procedures are performed under general anaesthesia, an anaesthesiologist and specialist nurses are added. Before any procedure, the patient's history must be taken and a thorough physical examination must be given. For appropriate patient selection, the physician must obtain information on previous therapies and current performance status. Laboratory tests (e.g. complete blood count, electrolytes, coagulation profile, electrocardiogram, chest radiograph) are recommended. Additional studies such as computed tomography (CT), pulmonary function tests, and assessment of arterial blood gases may be required depending on the nature of the procedure. Indications for therapeutic endoscopic treatment are mainly palliation of advanced cancerous lesions, but increasingly also a cure of early lung cancer. The former is mainly indicated for the relief of dyspnoea due to central airway obstruction, and the pre-operative evaluation should ideally establish that the lung beyond the obstruction is viable and that dyspnoea is effectively related to the obstruction. Figure 1⇑ schematically illustrates the three main types of malignant airway obstruction. Curative treatment of early lung cancer is an area in full development and clear guidelines cannot be given at this stage. For clarification of the terminology in this field, the various endoscopically-visible lesions from normal tissue to invasive carcinoma are defined as follows: 1) normal tissue: normal epithelium without significant histological change; 2) inflammation: characterized by marked infiltration of acute and chronic inflammatory cells, without significant atypia/dysplasia; 3) metaplasia/hyperplasia: mucus cell hyperplasia, basal cell hyperplasia without atypia (two to three layers maximum); 4) mild atypia/dysplasia: basal cell hyperplasia with nuclear atypia, three or more layers confined to the lower one-third of stratum, slight nuclear enlargement, rare mitotic figure; 5) moderate atypia/dysplasia (abnormal/premalignant change): basal cell hyperplasia with nuclear atypia, basal cells extending into the lower two-thirds of stratum, slight nuclear enlargement with loss of polarity, occasional mitotic figure; 6) severe atypia/dysplasia (abnormal/premalignant change): basal cell hyperplasia with nuclear atypia, basal cells extending to upper one-third of full thickness of stratum, nuclear enlargement, loss of polarity, uneven chromatin disbursement, frequent mitotic figures, keratinization; 7) carcinoma in situ (abnormal/premalignant change): polyhedral cells with variably-sized nuclei, loss of polarity, uneven chromatin disbursement, frequent mitotic figures, keratinization; 8) microinvasive carcinoma (abnormal/premalignant change): infiltration of cancer within the bronchial mucosa, but not extending any deeper into the wall; and 9) invasive carcinoma (abnormal/premalignant change): infiltration of cancer into the bronchial cartilage and bronchial wall. Continuous pulse oximetry and other monitoring procedures must be performed according to local conscious sedation guidelines. Although several procedures can be performed by flexible bronchoscopy with local anaesthesia and conscious sedation, the interventional bronchoscopist should be prepared to convert to general anaesthesia, if the situation requires. Rigid bronchoscopy is defined as the transoral or transtracheotomy passage of rigid instruments for diagnosis or therapy, aided by various light sources, telescopes, and accessory instruments. Rigid bronchoscopy may require any of these four types of equipment: 1) classic ventilating bronchoscopes: open tubes with bevelled distal ends, usually with a proximal end that contains several ports for light guides, telescopes, introduction of instruments, and assisted ventilation; 2) rigid instruments for endoscopy in tracheal disorders: solid tubes without side ports; 3) bronchoscopes for distal airway endoscopy: tubes with side ports to maintain bilateral ventilation; or 4) various angled telescopes that can be attached to video cameras to provide excellent airway visualization and documentation. Because rigid bronchoscopy is usually performed under general anaesthesia, anaesthesiologists, nurses, and other assistants familiar with the procedure must assist the bronchoscopist. General anaesthesia is administered intravenously or by inhalation. Currently, intravenous anaesthesia is preferred. Ventilation techniques that can be used include: spontaneous ventilation, spontaneous assisted ventilation, controlled ventilation with Venturi Jet, high-frequency ventilation, or closed-circuit positive pressure ventilation. After the induction of anaesthesia, the patient's head is partially extended and the bronchoscope is inserted in the midline, with the bevel anterior. The operator's finger or a plastic tooth protector protects the upper teeth. The bronchoscope is advanced to and passed under the epiglottis and then rotated 90°, so it can be passed atraumatically through the vocal cords. Once the trachea is entered, the bronchoscope is rotated back 90° and advanced toward the lower airways. To examine one of the bronchial trees, the bronchoscopist rotates the patient's head toward the contralateral shoulder. In an intubated patient, the bronchoscope is advanced along the endotracheal tube to the level of the vocal cords. The endotracheal tube is then removed and the bronchoscope passed into the trachea. Another technique of intubation involves the use of a laryngoscope to lift the epiglottis anteriorly and allow passage of the bronchoscope to the level of the vocal cords. At this point, the operator looks through the bronchoscope and guides it through the vocal cords. A telescope is used through the bronchoscope to provide adequate visualization to the level of the segmental airways. A number of diagnostic and therapeutic procedures can be performed through the rigid bronchoscope. The primary indications for rigid bronchoscopy are: management of massive haemoptysis, treatment of tracheobronchial stenosis, foreign body removal, tumour resection, and deep bronchial-wall biopsy. Therapeutic procedures such as mechanical resection and dilation can be accomplished with the barrel of the scope alone. Tools such as laser fibres, cryotherapy and electrocautery probes, balloon dilators, stents, suction catheters and various biopsy and retrieval forceps can be inserted through the barrel of the rigid bronchoscope. Contraindications specific to rigid bronchoscopy include: an unstable cervical spine, severe maxillofacial trauma or deformity, or obstructing oral or laryngeal disease. Training in rigid bronchoscopy should be reserved for physicians who have had extensive experience with flexible bronchoscopy and endotracheal intubation. Trainees should first practice on mannequins or animal models and should perform at least 20 supervised rigid bronchoscopy procedures before attempting this procedure alone. To maintain competency, the procedure should be performed at least 10–15 times·yr−1. Complications of rigid bronchoscopy include injury to lips, teeth, gums, larynx and the tracheobronchial wall. The suggested reading for this section is 3–7. Transbronchial needle aspiration (TBNA) is a technique for performing cytological, histological, or microbiological sampling of lesions within the airway wall, the lung parenchyma, and mediastinal structures adjacent to the tracheobronchial tree. Selection of a proper needle depends on the indication; except when sampling submucosal lesions, all diagnostic needles should be ≥13 mm long. To obtain a specimen for histological examination, a 19-gauge or larger needle should be used. Specimens for cytological examination can be obtained using 22-gauge or larger needles. For mediastinal and hilar lesions, a needle with a stiff catheter is required. For peripheral lesions, a needle with a softer catheter should be used. To aspirate a mediastinal cyst or an abscess, a 21-gauge, 15-mm long needle with a wider and stiffer catheter should be used. To prevent damage to the working channel of the flexible bronchoscope, all needles should be of retractable design. In addition to the bronchoscopist, the procedure requires a dedicated assistant. TBNA is most often performed through a flexible bronchoscope. The chest radiograph and the CT of the chest should be thoroughly reviewed to locate the lesion precisely before elective TBNA. For peripheral lesions, TBNA should be performed with fluoroscopic guidance. When staging lung cancer, contamination of samples with bronchial secretions should be avoided. The flexible bronchoscope can be introduced into the bronchial tree without using suction. Tracheobronchial secretions covering the target site should be washed off. TBNA can be performed before the endobronchial examination and prior to obtaining any endobronchial specimens. Syringe suction, applied at the proximal end of the TBNA catheter, should be ceased before the needle is withdrawn from the tracheobronchial wall. In patients with multiple lymph node station involvement, the nodes with the worst prognosis (N3) are sampled first. Two satisfactory specimens should be obtained from each target site. Each disposable needle should be used in one patient only. Cytological specimens can be prepared immediately by spraying the sample on a slide for on-site inspection or for fixation. Flushing the sample into a preservative solution for a cellblock is also acceptable and is the preferred method for histological specimens. Cytological specimens must be read by an experienced cytopathologist. Rapid on-site evaluation of the specimen improves the diagnostic yield. Each specimen should be clearly classified as definite, malignant, or negative. Staging of bronchogenic carcinoma should not be based on a small number of tumour cells. The presence of a large number of lymphocytes in the specimen establishes that it is adequate for a lymph node sample. Respiratory epithelial cells in the sample should raise concern about possible contamination. A true positive sample exhibits a large number of tumour cells in clumps or gland formation. A true negative sample should have a large number of lymphocytes. A negative TBNA does not rule out malignancy. Every positive result should be interpreted individually, using a team approach of the clinicians involved. Major applications for TBNA are the diagnosis and staging of bronchogenic carcinoma by sampling of mediastinal and hilar lymph nodes, as well as the diagnosis of peribronchial/tracheal masses, submucosal disease, and peripheral lung nodules. Minor applications are the diagnosis of necrotic or haemorrhagic endobronchial exophytic lesions, predicting the line of surgical resection, follow-up of small cell carcinoma or lymphoma, and diagnosis and drainage of mediastinal cysts and abscesses. The diagnostic yield of TBNA for staging of lung cancer varies between 15–83%, with positive predictive values of 90–100%. TBNA is more likely to be successful when: a histology needle is used; small cell cancer is present; the carina is abnormal; radiographical evidence suggests mediastinal disease; the lesions are right-sided; the lymph nodes are large; or the lesions are in a paratracheal or subcarinal location. In evaluating peripheral lung nodules, TBNA increases the diagnostic yield of flexible bronchoscopy by 20–25% by facilitating the sampling of lesions that are inaccessible with the forceps or brush. TBNA has also been shown to improve the yield in the evaluation of submucosal disease, sarcoidosis, and mediastinal lymphadenopathy in acquired immune deficiency syndrome (AIDS) patients. Major complications are rare. Self-limited minor bleeding, pneumothorax, pneumomediastinum, or an inadvertent puncture of the adjacent structure can be avoided through proper knowledge of the mediastinal anatomy as well as a thorough review of the CT of the chest. Damage to the flexible bronchoscope during TBNA is a genuine concern and can be avoided by rigorously following optimal procedures. TBNA should be performed by, or under the supervision of, an expert bronchoscopist. At least 25 TBNA procedures should be performed with cytology needles and 10 positive specimens should be obtained before attempting to use histology needles. The suggested reading for this section is 8–13. Autofluorescence bronchoscopy (AFB) uses devices that detect normal and abnormal tissue fluorescence to inspect the tracheobronchial tree in order to identify premalignant and malignant mucosal abnormalities. Fluorescence bronchoscopy systems aid in locating areas of malignant and premalignant mucosa that may not be identifiable with conventional white-light bronchoscopy. Preliminary studies have shown that fluorescence bronchoscopy improves sensitivity and localization of endobronchial mucosal abnormalities such as, dysplasia and carcinoma in situ. The application of this new technology is presently being evaluated in the screening of patients at risk for developing bronchogenic carcinoma. There are no known contraindications to the use of fluorescence bronchoscopy other than those for routine white-light bronchoscopy. AFB may improve sensitivity at the cost of specificity when it is used to identify mucosal abnormalities not seen by conventional white-light bronchoscopy. Further studies are necessary to determine the appropriate use of these devices in the management of patients at risk for bronchogenic carcinoma. No complications have been reported from fluorescence bronchoscopy other than those of flexible bronchoscopy. Fluorescence bronchoscopy should be reserved for physicians with proven expertize in diagnostic bronchoscopy; in addition, it has a long learning curve. The suggested reading for this section is 14–19. Endobronchial ultrasound (EBUS) is a diagnostic technique for visualizing the tracheobronchial wall and the immediate surrounding structures. Ultrasound waves are transmitted to anatomical structures, and the reflected echoes are transformed into electrical signals. Ultrasound probes are of two types: 1) sectorial transducers of 7.5 MHz incorporated in the tip of specially-designed 7-mm flexible bronchoscopes; and 2) balloon-tipped miniaturized probes of 2.8–3.2 mm, with 12- and 20-MHz transducers that can be inserted through the working channel of conventional flexible or rigid bronchoscopes. Also needed are a driving unit to rotate the miniaturized probes as well as an ultrasound processor, which produces ultrasonic waves and creates the images. The ultrasound probe is gently pressed to the bronchial wall and passed along the structures to be investigated. For circular views, the instrument has to be rotated 360° around its axis. At the target site, the balloon is inflated with distilled water until close circular contact is achieved and the wall and surrounding structures become visible. The images are stored on video and photographic prints. The trachea can be examined for a short time if the patient is sedated or placed under general anaesthesia and if pre-oxygenation is sufficient. The probe can be passed to all regions of interest. EBUS is used to evaluate the regional extension of lymph-node involvement in bronchogenic carcinoma (staging), to identify and localize mediastinal structures adjacent to the airways (mediastinal tumours, heart, and oesophagus and great vessels) before diagnostic or therapeutic interventions, to localize solid structures in the lung tissue for bioptic procedures, and to stage the depth of tumour invasion in the bronchial wall. In these situations, EBUS may complement CT. There are no contraindications for EBUS other than those for flexible bronchoscopy. The role of EBUS as compared to established radiological diagnostic procedures has yet to be assessed by prospective multicentre studies. Complications, specific for EBUS, have not been reported. EBUS should be reserved for experienced bronchoscopists and it has a long learning curve. The trainee should become familiar with ultrasonic imaging and should participate in ∼40 supervised procedures. In order to maintain competence, 25 procedures·yr−1 should be performed. The suggested reading for this section is 20–25. Transthoracic needle aspiration/biopsy (TTNA/B) is the percutaneous sampling of lesions involving the chest wall, lung parenchyma, and mediastinum for cytological, histopathological, or microbiological examinations. The following is a list of equipment and personnel needed to perform this sampling procedure: 1) aspiration needles of the appropriate length, gauge (18–25), and design (cutting versus noncutting) based on the desired sample; 2) roentgenographic or ultrasonic guidance to locate the lesion and guide needle placement; 3) supplies to prepare the specimen; 4) pneumothorax drainage catheter/tube; 5) cardiac and oxygen saturation monitor; 6) trained assistants. Depth, angle, and site of needle penetration should be estimated in advance. After local anaesthesia is supplied, the needle or trocar can be introduced in a sterile fashion under fluoroscopy, CT, or ultrasound guidance. Specimens can then be sprayed onto slides or into solution and processed using standard cytological techniques. Indications for TTNA/B include the diagnosis of peripheral lung nodules or infiltrates, pleural masses, selected cavitary lesions, mediastinal masses, and other thoracic lesions accessible via percutaneous approach. Contraindications for TTNA/B are uncorrectable coagulopathy, uncorrectable hypoxaemia, haemodynamic instability, pulmonary hypertension, bullous emphysema, and lesions too close to a vascular structure. Relative contraindications are previous pneumonectomy and a forced expiratory volume of <1 L.
TTNA/B has an overall diagnostic sensitivity of 68–96%, a specificity of ⪕100%, and an accuracy of 74–96% in lesions of all sizes. In smaller lesions, its diagnostic accuracy is lower. The incidence of pneumothorax is ∼20–40%, and 50% of those with pneumothorax require chest-tube placement. Self-limiting haemorrhage and haemoptysis are infrequent. TTNA/B should be performed by, or under the supervision of, an experienced pulmonologist or radiologist. Trainees should first practice on inanimate objects, and they should perform ≥10 supervised procedures before attempting this procedure alone. In order to maintain competence, 5–10 procedures a year should be performed. Treatment for complications (e.g. chest-tube placement for pneumothorax) should be available. The suggested reading for this section is 26–30. Laser bronchoscopy is the use of laser energy delivered via standard bronchoscopes in order to treat a variety of endobronchial disorders. Only lasers with wavelengths that can be delivered through an optical fibre are suitable for laser bronchoscopy. These include the potassium titanyl phosphate (KTP), argon dye, yttrium aluminium pevroskite (YAP), Nd-YAG (neodymium-yttrium aluminium garnet) and diode lasers. The Nd-YAG laser is currently preferred for airway resection because of its predictable effects on living tissue (i.e. photocoagulation or vapourization), depending on the amount of energy applied. Physicians performing laser bronchoscopy should have expertize both in flexible and rigid bronchoscopy as well as a working knowledge of laser physics. Accreditation by an institution's laser committee may be required. In addition to the support personnel normally required for standard bronchoscopy, one assistant should have sole responsibility for controlling the laser. Because most lasers used in bronchology pose a risk of ocular damage from reflected energy, protective eyewear is required for the patient as well as the laser team. Laser bronchoscopy can be performed with flexible or rigid bronchoscopes. Most experts prefer the rigid bronchoscope technique for four reasons: 1) the use of general anaesthesia is more comfortable for the patient and the physician; 2) the open tube allows the laser fibre, suction catheters, and forceps to be used simultaneously; 3) ventilation and excessive bleeding are more easily controlled with the rigid bronchoscope; and 4) the bronchoscope can be used to perform dilatation and mechanical resection, thus shortening procedure time, diminishing the amount of laser exposure, and providing more complete relief of obstruction. Furthermore, if indicated, silicone stent placement can be performed during the same procedure. Among the relative disadvantages of the rigid technique are the increasing cost of the procedure, resulting from the need for general anaesthesia, operating room time and personnel, as well as the fact that upper lobe lesions are not easily treated. The flexible bronchoscope can be used through the rigid bronchoscope in conditions when increased manoeuvrability is required. Safe laser resection depends on maintaining ventilation, preventing haemorrhage, and minimizing laser exposure. The nonobstructed airways must be inspected frequently and kept clear of debris, clots and bloody secretions. To minimize the risk of haemorrhage, it is important to coagulate the lesion with low laser power (e.g. 30–45 watts (W), pulse duration of 1 s, fibre distance at 1 cm) before resection. If the fibre is too close to the target (e.g. within 3 mm), the tissue will be charred and vapourized. Laser exposure should be minimized by using mechanical resection whenever possible. Continuous suction is recommended to remove smoke. Oxygen saturation should be continuously monitored. Inspired oxygen concentration should not be >40% in order to minimize the risk of igniting flammable devices (e.g. suction catheters, laser fibres, flexible endoscopes). Any obstruction within the lumen of the central airways (i.e. the trachea, right and left main stem bronchi, bronchus intermedius and lobar orifices) that compromises ventilation and produces significant symptoms can be considered for laser resection. The most common indication is inoperable cancer, either primary lung cancer or endobronchial metastasis. Laser resection may be combined with radiation therapy or chemotherapy. Laser therapy induces immediate effects, in contrast with cryotherapy or brachytherapy. Other indications include tumours of uncertain prognosis (adenoid cystic carcinomas, carcinoid tumours), benign endobronchial tumours, and iatrogenic or postinfectious cicatricial stenosis of the trachea or main stem bronchi. Combination therapy with mechanical dilatation and prosthetic stents is often required. The absolute contraindication to laser bronchoscopy is isolated extrinsic compression of the airways (fig. 1⇑). The main purpose of laser treatment in malignant disease is to improve quality of life, which is achieved in the majority of treated patients. In patients with critical airway obstruction, survival is increased. Success rates for relief of malignant obstruction are >90% for lesions in the trachea and main bronchi, but decrease to 60–70% for more distal lesions. In benign cicatricial stenosis, success rates are high (>90%), but repeated treatments and/or stenting may be necessary. The most common complications of the procedure are haemorrhage, hypoxaemia, perforation and cardiac events. Complication rates should be <5%. Trainees should attend a theoretical course on laser physics and application in medicine. They should train first on inanimate or animal models. They should assist in ≥20 procedures before attempting this procedure alone. To maintain competency, a minimum of 10–15 laser procedures·yr−1 should be performed. The suggested reading for this section is 31–35. Endobronchial electrosurgery (EES) (synonyms: electrocautery or diathermy) is defined as the application of a high-frequency (HF) electrical current via a probe to coagulate or vapourize tissue. Argon-plasma coagulation (APC) is a noncontact mode of monopolar electrical coagulation; argon gas is used as the conductive medium. The equipment needed for EES and APC is as follows: 1) a HF electrical generator; 2) an insulated probe (rigid, flexible) to transfer the electrical current to the target tissue (types of probe are mono- and bipolar; monopolar probes may be rigid or loop, forceps or flexible snare, cutting or coagulating); 3) a neutral plate to complete the circuit, if a monopolar probe is used; 4) an insulated instrument to prevent electrical current leakage, if the procedure is performed with a flexible bronchoscope; and 5) in addition to the generator, argon gas (a tank with a flow meter) and a microelectrode catheter to transport gas and electrical current simultaneously, in APC. Both electrosurgery and APC use electrically-generated heat to destroy tissue. Depending on the energy used, either coagulation or vapourization can be induced. APC produces a more homogeneous, but superficial, thermal effect due to its noncontact nature and lower energy density. The use of rigid instruments is preferred for large, bulky lesions; whereas, the flexible bronchoscope is suitable for superficial and small lesions. APC is the preferred mode for haemostasis and possibly for lesions covering larger areas. The electrosurgery probe is placed in direct or close contact with the target tissue to deliver the current until the desired effect is seen. The energy setting (usually 25–50 W) can be tested first on a tiny spot of the normal bronchial mucosa before targeting the tumour tissue itself. It is important to apply continuous suction so that the target area remains free of blood and mucus and smoke is evacuated. Energy settings can be changed depending on the visible tissue effect. Indications for EES are essentially the same as those for laser surgery, and these include palliative debulking of endobronchial exophytic lesions, as well as treatment of benign endobronchial tumours and of iatrogenic or postinfectious cicatricial stenoses. Another indication for EES is potential cure of visible superficial lung cancer (severe dysplasia to microinvasive carcinoma). Indications for APC are coagulation of haemorrhage from an endoscopically-visible source, and treatment of granulomatous lesions in the airways (e.g. lesion in close vicinity to airway stents). EES and APC produce immediate effects. Absolute contraindications are the presence of a pacemaker susceptible to electrical interference or exclusive extraluminal obstruction of the airway (see fig. 1⇑). A relative contraindication is the presence of a metallic object in close proximity to either electrode. Therapeutic outcomes are comparable to those from other techniques that use thermal energy (e.g. laser, cryotherapy). Potential complications include bleeding, fire, airway perforation, and stenosis. Training in endobronchial electrosurgery should be reserved for a trainee who has had ample experience with rigid/flexible bronchoscopy and endotracheal intubation. Trainees should first practice on inanimate or animal models. They should perform ≥10 supervised procedures before attempting this procedure alone. In order to maintain competence, 5–10 procedures·yr−1 should be performed. The suggested reading for this section is 36–42. Cryotherapy is the therapeutic application of extreme cold for local destruction of living tissue. In contrast to laser or electrosurgery, cryodestruction is delayed, occurring from a few hours to a few days after application. Cryotherapy can be performed either through a rigid or flexible bronchoscope, requiring a rigid or flexible cryoprobe. Commonly used cryogens are nitrous oxide (N2O) and liquid nitrogen (N2). Cryotherapy exploits the cooling caused by rapid expansion of liquid gas to cool the tip of the cryoprobe (Joule-Thompson principle). The tip of the probe is cooled to a working temperature of −40°C, which is sufficient to destroy living tissue. The cryoprobe is placed on or inserted into the lesion 2–3 times to apply repeated cycles of freezing and thawing at the same location before moving to an adjacent site. The effect of freezing/thawing cycles can be monitored either visually or with impedance measurement. The duration of freezing is between 30–60 s. The thawing time depends upon the type of probe, ranging from a few seconds for a rigid probe to ⪕60 s for a flexible probe. A repeat bronchoscopy is usually performed within 1 week to remove slough tissue and repeat treatment if necessary. Cryotherapy can be safely performed in a high-oxygen environment. Cryotherapy is used mainly for palliation of noncritical endobronchial exophytic obstructive lesions and to remove foreign bodies and clots. Other indications may include treatment of low-grade malignant lesions (e.g. adenoid cystic carcinoma) and early cancer (e.g. carcinoma in situ). Contraindications are extraluminal obstruction of the airway or obstruction by cryoresistant tissues (e.g. fibrous tissue or cartilage). Therapeutic outcomes are comparable to those from other techniques that use thermal effects (e.g. laser, electrosurgery); therapeutic effects are not immediate, but are seen after a few days. Clean-up bronchoscopies may be necessary to remove debris. Complications can be expected in <5% of cases. They include bleeding and transient increase in airway obstruction due to tumour hyperaemia. Use of cryotherapy should be reserved for bronchoscopists who have had ample experience with rigid/flexible bronchoscopy and endotracheal intubation. Trainees should first practice on inanimate or animal models and should perform ≥10 supervised procedures before attempting this procedure alone. In order to maintain competence, 5–10 procedures·yr−1 should be performed. The suggested reading for this section is 43–47. Airway stents or tracheobronchial endoprostheses are hollow prosthetic devices used to re-establish airway patency, either to support the tracheobronchial wall in stenosis or malacia or to seal off airway fistulas. Various types of stents are described in table 1⇓. Most stents are available in various shapes (straight, Y-shaped, J-shaped), diameters, and lengths. Stents are made of polymers, metal, or a combination of both (hybrids). Delivery devices include a rigid bronchoscope and its accessories, specially-designed rigid stent introducer systems (generally for polymer stents), a flexible bronchoscope and its accessories, and specially designed flexible stent introducer systems (generally for metal stents and hybrids). In certain situations (i.e. narrow, curvilinear stenosis), fluoroscopic guidance may be necessary. First, the type, length, and diameter of the stenosis (fig. 1⇑) are assessed by bronchoscopy. Additional information can be obtained by CT (e.g. local anatomy, airways distal to stenosis, pulmonary artery patency). Some degree of airway patency needs to be established before the bronchoscope is introduced. Options include dilatation of extrinsically-compressed airway or resection of endoluminal lesions. The optimal length of the stent should exceed the margins of the stenosis; the external diameter should be slightly larger than the normal diameter of the involved airway. Selection of a specific stent depends on the type of the stenosis. Endoscopic and radiographical confirmation of stent position and patency are essential. Indications for airway stenting are: 1) extrinsic stenosis of central airways with or without intraluminal components due to malignant or benign disorders; 2) complex, inoperable tracheobronchial strictures; 3) tracheobronchial malacia; 4) palliation of recurrent intraluminal tumour growth; and 5) central airway fistulae (oesophagus, mediastinum, pleura). Uncovered metallic stents should be avoided whenever tissue ingrowth (tumour, granulation) may cause obstruction and if removal of the stent is anticipated. In general, stent placement should be avoided if nonviable lung is present beyond the obstruction. Each type of stent has unique contraindications (table 1⇑). Symptom relief and improvement in quality of life and pulmonary function can be achieved in the majority of patients. To date, long-term follow-up is available only for the Dumon silicone prosthesis (Endoxane®, Novatech SA, Grasse, France). In general, complications can be expected in ⪕20% of all cases (table 2⇓). Stent insertion should be reserved for bronchoscopists who have had ample experience with rigid/flexible bronchoscopy and endotracheal intubation. Trainees should first practice on inanimate objects or animal models and should perform ≥10 supervised procedures before attempting this procedure alone. In order to maintain competence, 5–10 procedures·yr−1 should be performed. The suggested reading for this section is 48–53. “Brachy” is a Greek root meaning short or near; thus brachytherapy allows localized tumour irradiation. Modes of brachytherapy include direct interstitial implantation of radioactive seeds into the tumour, implantation of sources using an injector system and flexible bronchoscopy, percutaneous CT-guided source placement, and, the most commonly used, delivery through a catheter inserted within the bronchoscope lumen. Brachytherapy requires specialized personnel and equipment. The personnel include, but are not limited to, a radiation oncologist, bronchoscopist, and appropriate support personnel. The equipment includes a separate room with appropriate shielding, and in the case of high-dose-rate (HDR) treatment, a remote afterloading device. Iridium 192 (192I) is the preferred radiation source at the present time. Afterloading catheters are inserted via a flexible bronchoscope. If the bronchi are totally occluded, initial debulking can be accomplished with a variety of devices. The catheter is advanced through the working channel of the bronchoscope until the desired location is reached. The catheter is secured, and dummy sources are loaded into the catheter to guide the calculation of dosimetry by the radiation oncologist. The position of the catheter can be confirmed by fluoroscopy or a chest radiograph. The patient can then be transported to the appropriate location for insertion of the 192I source. There is no consensus on optimal dose and frequency of fractionation. Low dose rate is arbitrarily set at 1–2 grays (Gy)·h−1 for 30–72 h. Intermediate or medium dose rate is 2–10 Gy·h−1 for 10 h. HDR is defined as >10 Gy·h−1 delivered in <1 h.
The primary indication for brachytherapy is palliation of symptoms caused by malignant airway obstruction such as cough, haemoptysis, and dyspnoea. Brachytherapy may also have a curative potential in selected cases of very early, superficial cancers (cancers not extending beyond the bronchial wall). Brachytherapy is considered safe in patients who have received prior external beam radiation therapy. Brachytherapy is contraindicated in patients who are unable to undergo routine bronchoscopy or have received prior endobronchial radiation in the same area within 6 months. Brachytherapy provides long-term palliation of symptoms in >50% of patients. Haemoptysis is improved in ⪕90% of cases. The addition of laser resection may improve the response to brachytherapy. Prolonged survival and improved quality of life have been reported with combination therapy. Complications related to the performance of bronchoscopy and afterload catheter insertion including pneumothorax, bleeding, infection, cough, catheter displacement, cardiac dysrythmia, and bronchospasm are rare (0.5%). Complications due to the effects of radiation therapy include fatal haemorrhage, tracheoesophageal fistula, tracheovascular fistula, soft tissue necrosis radiation bronchitis and bronchial stenosis. These occur in 5–15% of patients. Training in brachytherapy should be reserved for bronchoscopists who have had ample experience with flexible bronchoscopy and management of endobronchial malignancies. Trainees should perform ≥5 supervised procedures before attempting this procedure alone. In order to maintain competence, 5–10 procedures·yr−1 should be performed. The suggested reading for this section is 54–60. Photodynamic therapy (PDT) involves an intravenously-administered photosensitizer that, when exposed to light of the proper wavelength and in the presence of oxygen, causes cell death. The physician using PDT must be knowledgeable both in laser technology and photosensitizers. Photofrin II® (dihematoporphyrin ester; Quadra-Logic Technologies Inc., Vancouver, Canada) is the only photosensitizer that has received widespread approval, so far, for the treatment of lung cancer. The compound is activated by a laser light source at a wavelength of 630 nm. The treatment fibres used to deliver the light are quartz fibres configured as diffusers for cylindrical or interstitial treatment areas, or as a micro lens, for focused surface treatments. Light dosimetry is complicated and requires trained personnel. Following the recommended waiting period after the injection of the photosensitizer, the patient undergoes bronchoscopy and the area of abnormality can be illuminated with light of the appropriate wavelength. The light can be delivered in a superficial or interstitial manner (insertion of the probe in the tumour) as needed for homogeneous delivery to target tissue. The effects of PDT are not immediate, but occur within 48 h. Therefore, a clean-up bronchoscopy is needed for patients with obstructive lesions. Repeated illumination can be delivered if necessary. PDT has been approved in the USA, Japan and several European countries to treat superficial cancers not extending beyond the airway wall, in patients who are not candidates for surgery or external beam radiation therapy and as palliative therapy in patients with pulmonary symptoms from endobronchial obstruction due to late-stage cancer. PDT response is not dependant on the cell type of the tumour. PDT is contraindicated in patents with allergies to components of haematoporphyrin and in patients with porphryia, critical central airway obstruction, or in tumours invading major blood vessels or the oesophagus. PDT produces complete response rates in 60–80% of early-stage mucosal cancers. For obstructive lesions, PDT has been shown to palliate airway obstruction in 80% of patients. The major complication of PDT is skin photosensitivity, which can occur up to 4–6 weeks after injection. Local airway oedema, tumour necrosis and delayed strictures can cause airway obstruction. Haemorrhage and fistula perforation may result from tumour lysis. Training in PDT should be reserved for bronchoscopists who have had ample experience with flexible bronchoscopy and endotracheal intubation. Trainees should perform ≥10 supervised procedures before attempting this procedure alone. In order to maintain competence, 5–10 procedures·yr−1 should be performed. The suggested reading for this section is 61–67. Percutaneous dilatational tracheostomy (PT) is a bedside technique that consists of percutaneous needle puncture of the trachea, followed by stepwise or one-time dilatation and placement of a tracheostomy tube. The operator (a surgeon, intensivist, or pulmonologist) requires an assistant to sedate the patient, monitor vital signs, and handle the endotracheal tube. The additional presence of a bronchoscopist is recommended to evaluate proper positioning of the endotracheal tube, midline tracheal puncture, and correct advancement of guidewire and dilators. Various PT kits are commercially available with all necessary equipment and supplies. PT is performed in the intensive care unit in a supine, anaesthetized, and ventilated patient whose neck is placed in an extended position. The thyroid and the crycoid cartilages are identified. The operative area is prepared, while the patient receives 100% oxygen. Under endoscopic visualization, the endotracheal tube is withdrawn to bring its deflated cuff just below the vocal cords. If needed, local anaesthesia, can be applied. A horizontal incision, 1.5–2.0 cm long, can then be made over the first or the second tracheal interspace. A 12- or 15-gauge needle is inserted into the trachea in the midline, and a guidewire is introduced through it. The needle is removed, and either the Ciaglia or the Griggs/Schachner techniques can be used. An 8-French (F) guiding catheter is introduced into the trachea over the guidewire. The tracheostomy site is prepared by progressive dilation using 12-F–36-F lubricated dilators over this double guide. A lubricated tracheostomy tube loaded over an appropriately-sized dilator (e.g. 24-F dilator for an 8-mm tracheostomy tube) is then introduced into the trachea. The endotracheal tube is removed after auscultatory and bronchoscopic confirmation of correct tracheostomy tube positioning. Newer kits contain a single-tapered dilator, whereby tracheostomy stoma can be created with one insertion. The dedicated percutaneous tracheostomy tool (consisting of a beveled metal conus split in the centre, attached to a pair of pivotal handles), guided over the metal wire, is introduced firmly through the anterior tracheal wall and opened to dilate the tracheostomy site. The guidewire is removed and the tracheostomy cannula, fitted on a snug plastic trocar (with a deflated cuff), is placed into the trachea under direct observation. The trocar is removed, the cuff inflated, the endotracheal tube removed, and the tracheostomy cannula secured. The indications for PT are the same as for conventional tracheostomy. Relative contraindications include emergency situations, paediatric age, anatomical deformities, marked obesity, or coagulopathy. Absolute contraindications for PT are skin infections and prior major neck surgery. Randomized clinical trials have shown that early and late complication (stenosis) rates are as low or lower than for surgical tracheostomy, and with better cosmetic outcomes. PT can be performed in less time and is more cost-effective then conventional tracheostomy. Mortality from PT is low (0.2%) and the incidence of major complications <1.5%. Tracheal laceration, false channel insertion, and haemorrhage are the most commonly-reported complications. Only physicians who have extensive experience in airway management and critical care medicine should attempt PT. The trainee should perform 5–10 procedures under experienced supervision before performing it independently. Experience may be obtained in training programmes or through specific coursework. Ten procedures·yr−1 are needed to maintain expertize with the procedure. The suggested reading for this section is 68–72. Transtracheal oxygen therapy (TTOT) is a method of long-term continuous oxygen delivery using a catheter inserted into the trachea through a tracheocutaneous tract. Any patient who needs continuous, long-term oxygen therapy is a potential candidate for TTOT. TTOT is advised in cases of refractory hypoxaemia, oxygen requirements >3–4 L·min−1, intolerance to nasal cannula (epistaxis, local irritation or allergy), voluntary or involuntary noncompliance (cosmetic reasons, nocturnal dislodgement), the need to improve mobility by reducing oxygen flow, and loss of olfactory sensation. Contraindications are herniation of the pleura at the insertion site (emphysematous bleb), coagulopathies, severe comorbid conditions or terminal illness, impaired cough reflex, lack of willingness, ability, or family support to take care of the catheter, inability to communicate, and upper airway obstruction. A variety of TTOT catheters are available. The literature favours the use of a multistep procedure kit (SCOOP, Transtracheal Systems, Denver, CO, USA) to promote standardization of the technique, improve adaptation by the patient, and minimize complications. For high-flow oxygen therapy (>4 L·min−1), the permanent catheter with multiple fenestrations is preferred. This reduces back-pressure and inadvertent disconnection of the oxygen tubing. The catheter should be ≥3 mm in diameter and long enough so that the distal tip will be 2–3 cm above the carina. Proper patient and family education is mandatory prior to the TTOT procedure. The competence of the patient or the family to care for the catheter must be established. The multistep TTOT procedure involves aseptic catheter insertion in the trachea, under local anaesthesia using the Seldinger technique. During the first week after insertion, the initial catheter allows for tract formation. No oxygen is delivered during this period. The initial catheter is replaced with a softer, single-port catheter for oxygen delivery. This is left in place for 8 weeks and cleaned without removal. The final step involves replacement of the second catheter with a softer fenestrated catheter, which can be replaced and cleaned by the patient through a mature tracheocutaneous fistula. The use of antibiotics, cough suppressants, and pain medications is advocated during the first week. The patient's competency must be evaluated at every visit, which should be at least every 3 months for the first year after the TTOT insertion. The TTOT catheter should be replaced according to the manufacturer's recommendations. TTOT produces therapeutic levels of blood oxygen content with lower flow rates (39–72%) than those needed in other oxygen delivery systems, at rest as well as during exercise. Minute ventilation and the work of breathing are reduced. Exhaled minute ventilation and the carbon dioxide pressure in arterial blood (Pa,CO2) remain unchanged. The metabolic work performed by the inspiratory muscles and the diaphragm is also reduced. Exercise endurance, assessed by the 12-min walk, is better with TTOT than with oxygen via nasal cannula. TTOT may confer a greater survival benefit than does oxygen therapy by nasal cannula, as well as better quality of life by producing significant, subjective improvement in dyspnoea, olfactory sensation, oral intake, weight gain, and overall sense of wellbeing because of cosmetic factors, feeling of independance, and a trend towards less depression and improved morale. The most important major complication is mucus ball formation around the catheter, which may lead to upper airway obstruction necessitating catheter removal. Minor complications are either procedure related (e.g. cephalad catheter displacement and subcutaneous emphysema) or early, usually transient, problems such as increased cough and sputum production. Training in TTOT should be reserved for senior fellows and pulmonologists experienced in the Seldinger technique. Trainees should perform ≥5 supervised procedures before attempting this procedure alone. In order to maintain competence, ≥5 procedures·yr−1 should be performed. The suggested reading for this section is 73–78. Multimodality treatment is the combination of various endoscopic techniques or the combination of endoscopic with nonendoscopic modalities to treat tracheobronchial lesions. The various endoscopic treatment modalities are fairly new, and many therapeutic endoscopists are familiar with only a few of them. Therefore, reports comparing various endoscopic techniques for identical indications are rare. Some of these techniques are almost exclusively competitive, such as laser and endobronchial electrosurgery; therefore, most specialists will use either the one or the other. Some techniques are complementary (e.g. stents and laser or stents and endobronchial electrosugery); they are classically combined in mixed lesions (fig. 1⇑) that have an endoluminal component, amenable to resection and an extraluminal component that needs dilatation and stent insertion to maintain airway patency. 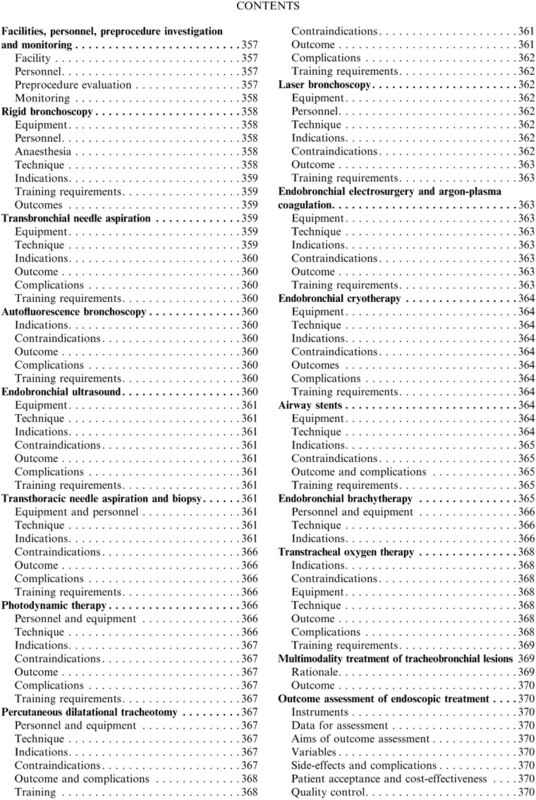 The relative values of each technique for a certain type of airway lesion are listed in table 3⇓, which provides guidance for selecting treatment combinations. A topic that has not been extensively investigated is the combination of endoscopic with nonendoscopic treatment modalities. This combination is mainly used in the treatment of inoperable malignancies of the central airways. In practical terms, multimodality treatment in these situations means the combination of radiochemotherapy with one or more endoscopic treatment modalities. The term multimodality, as used by oncologists, usually refers only to radio- and/or chemotherapy as well as surgery. It is the opinion of this task force that the term should be expanded to encompass endoscopic treatment. It is very important to decide what form of treatment should be used, and in what situation. 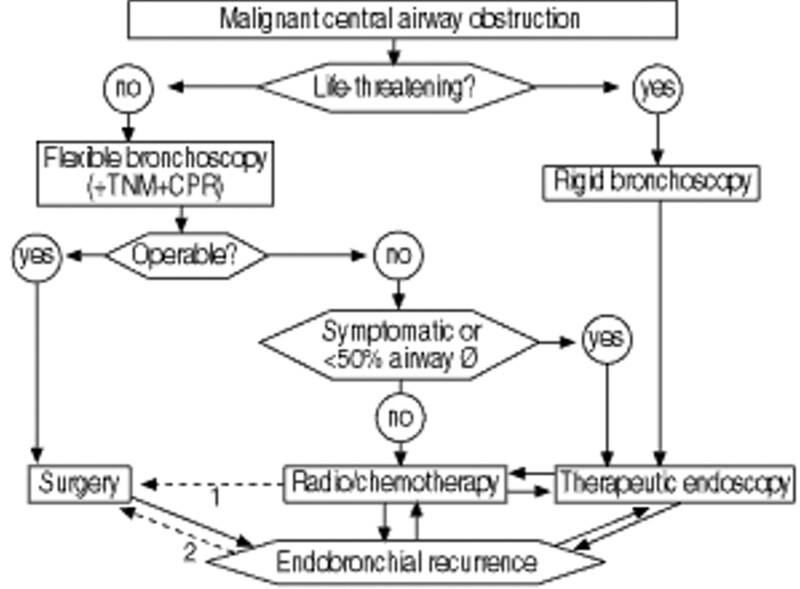 Figure 2⇑ shows a recently proposed algorithm for the management of malignant central airway obstruction. The choice of the initial treatment largely depends on the urgency of the situation as well as on previous treatment. High-grade obstructions at the level of the trachea, of the main carina, or of both main bronchi often must be relieved by emergent endoscopic treatment in order to guarantee survival. To assess the technical feasibility of endoscopic treatment and to plan treatment, diagnostic bronchoscopy must be performed, most often (in nonvital situations) with a flexible bronchoscope. If a lesion is resectable, as most benign lesions are, surgery is the treatment of choice. For unresectable central airway lesions (usually defined as up-to-lobar level) that cause symptoms or reduce the airway diameter by >50%, many endoscopists prefer to relieve the obstruction endoscopically before proceeding to nonendoscopic modalities. Airway obstruction of >50% seems a reasonable indication for performing endoscopic treatment, as patients with obstruction to this degree are usually symptomatic or can become symptomatic when nonendoscopic treatment (e.g. radiotherapy) causes tissue swelling. The decision to select endoscopic treatment will always have to be individualized. In malignancies, it also depends on the tissue diagnosis. Small cell carcinomas and lymphomas are chemosensitive, so they can be treated nonendoscopically even when they cause >50% obstruction. In reality, however, the majority of patients with malignant disease who are referred for endoscopic treatment have already exhausted all nonendoscopic options. There are very few outcome studies on multimodality treatments. Combining purely endoscopic treatments (e.g. laser photoresection and stent insertion) is safe, and both treatments can be performed in the same session. External beam irradiation or chemotherapy can also be safely performed immediately after endoscopic treatment. Multimodality treatment has also been shown to extend the duration of local tumour control. However, to date, there are no data unequivocally showing what endoscopic treatment to use as well as what multimodality approach might be best to use in a particular situation. Therefore, it is clear that prospective outcome studies are needed. The suggested reading for this section is 51, 79–83. Outcome assessment of interventional pulmonological procedures is the comparison of diagnostic results (e.g. accuracy) or therapeutic results (e.g. cure, survival, quality of life) with data found in recommendations, guidelines, general rules, or standards published by researchers, scientific societies, or governmental institutions. All relevant data should be stored on conventional or digital documentation systems. Interventional procedures, in particular, should be documented on video and photographic film. The data should include patient history, results of pre- and postinterventional clinical and laboratory investigations, indication for treatment, informed consent, the procedure itself, monitoring, and results of the procedure, side-effects, and complications. The aim of diagnostic procedures is detection or exclusion and classification of pathological processes as the basis for treatment. Ideally, the procedure should have a well-defined place on a flow chart for each indication. For therapeutic procedures, main and secondary endpoints for evaluation are commonly assessed. In palliative procedures, the degree of relief from symptoms and quality of life are the main criteria, survival being a secondary outcome. For curative treatment, definite healing and survival time must also be documented in long-term follow-up. For diagnostic procedures, sensitivity, specificity, and diagnostic accuracy must be compared to those of rival methods. For therapeutic procedures, regular noninvasive measurements are regularly performed relating to the degree of dyspnoea, pulmonary function tests (flow/volume loops), chest radiograph, and performance. Quantitative measurements of the cross-sectional area of the involved airway are performed by visual estimate or by laser or ultra-fast CT, if they are available. All side-effects and complications should be reported. These include: minor side-effects (e.g. arrhythmias not necessitating treatment); mild infections in stents; mucosal swelling during brachytherapy, electrocautery or PDT; minor bleeding; cough or pneumothoraces not requiring drainage in biopsy procedures; and tracheal puncture. In addition, severe complications include profuse bleeding, asphyxia, perforation, necrosis, fistulation and abscess formation, stent migration, recurrent obstruction, and laser fire. Patient acceptance related to the procedure and to other treatment-related factors, such as waiting time, environment, and attitude of staff, have only recently gained attention. In contrast, detailed analyses of costs with regard to equipment, human and other resources have become of more concern, especially with respect to refunding, acquisition of instruments, and organization of working hours. Practitioners should compare their own data to official recommendations, general rules, and standards. The outcomes are analysed with respect to the goals. If deficiencies are detected, the causes can be analysed and appropriate countermeasures can be taken. The effect of improvements is evaluated by continuous outcome assessment. The suggested reading for this section is 51, 82, 84–87. Loddenkemper R. Thoracoscopy - state of the art. Eur Respir J 1998;11:213–221. Ghaye B, Dondelinger RF. Imaging guided thoracic interventions. Eur Respir J 2001;17:507–528. Miller JI Jr. Rigid bronchoscopy. Chest Surg Clin North Am 1996;6:161–167. Helmers RA, Sanderson DR. Rigid bronchoscopy: The forgotten art. Clin Chest Med 1995;16:393–399. Beamis JF. Rigid bronchoscopy In: Beamis J, Mathur P, editors. Interventional PulmonologyNew York, McGraw-Hill, 1998; pp. 17–28. Mathisen DJ, Grillo HC. Endoscopic relief of malignant airway obstruction. Ann Thorac Surg 1989;48:469–473. Turner JF, Ernst A, Becker HD. Rigid bronchoscopy: How I do it. J Bronchol 2000;7:171–176. Dasgupta A, Mehta AC, Wang KP. Transbronchial needle aspiration. Semin Respir Crit Care Med 1997;18:571–581. Gasparini S, Ferretti M, Secchi EB, Baldelli S, Zuccatosta L, Gusella P. Integration of transbronchial and percutaneous approach in the diagnosis of peripheral pulmonary nodules or masses. Chest 1995;108:131–137. Schenk DA, Chambers SL, Derdak S, et al. Comparison of the Wang 19-gauge and 22-gauge needles in the mediastinal staging of lung cancer. Am Rev Respir Dis 1993;147:1251–1258. Wang KP, Fuenning C, Johns CJ, Terry PB. Flexible transbronchial needle aspiration for the diagnosis of sarcoidosis. Ann Otol Rhinol Laryngol 1989;98:298–300. Wang KP, Terry PB. Transbronchial needle aspiration in the diagnosis and staging of bronchogenic carcinoma. Am Rev Respir Dis 1983;127:344–347. Wang KP. Transbronchial needle aspiration to obtain histology specimen. J Bronchol 1994;1:116–122. Hung J, Lam S, LeRiche JC, Palcic B. Autofluorescence of normal and malignant bronchial tissue. Lasers Surg Med 1991;11:99–105. Lam S, MacAulay C, Hung J, LeRiche J, Profio AE, Palcic B. Detection of dysplasia and carcinoma in situ using a lung imaging fluorescence endoscope (LIFE) device. J Thorac Cardiovasc Surg 1993;105:1035–1040. Lam S, MacAulay C, LeRiche JC, et al. Early localization of bronchoscopic carcinoma. Diagn Ther Endosc 1994;1:75–78. Lam S, Kennedy T, Unger M, et al. Localization of bronchial intraepithelial neoplastic lesions by fluorescence bronchoscopy. Chest 1998;113:696–702. Sato M, Saito Y, Usuda K, Takahashi S, Sagawa M, Fujimura S. Occult lung cancer beyond bronchoscopic visibility in sputum-cytology positive patients. Lung Cancer 1998;20:17–24. Woolner LB, Fontana RS, Cortese DA. Roentgenographically occult lung cancer: pathologic findings and frequency of multicentricity during a 10-year period. Mayo Clin Proc 1984;59:453–466. Becker HD. Bronchoscopy for airway lesions In: Wang KP, Metha AC, editors. Flexible BronchoscopyOxford, Blackwell, 1995; pp. 136–159. Shannon JJ, Bude RO, Orens JB, et al. Endobronchial ultrasound guided needle aspiration of mediastinal adenopathy. Am J Respir Crit Care Med 1996;153:1424–1430. Ono R, Suemnasu K, Matsunaka T. Bronchoscopic ultrasonography for diagnosis of lung cancer. Jpn J Clin Onocol 1993;23:34–40. Ono R, Hirano H, Egawa S, Suemasu K. Bronchoscopic ultrasonography and brachytherapy in roentgenogically occult bronchogenic carcinoma. J Bronchol 1994;3:281–287. Hurther Th, Harnath P. Endobronchial sonography. Feasibility and preliminary outcome. Thorax 1992;47:565–567. Kurimoto N, Murayam M, Yoshioka S, Nishisaka T, Inai K, Dohi K. Assessment of usefulness of endobronchial ultrasonography in determination of depth of tracheobronchial tumor invasion. Chest 1999;115:1500–1506. Larscheid RC, Thorpe PE, Scott WJ. Percutaneous transthoracic needle aspiration biopsy: a comprehensive review of its current role in the diagnosis and treatment of lung tumors. Chest 1998;114:704–709. Khouri NF, Stitik FP, Erozan YS, et al. Transthoracic needle aspiration biopsy of benign and malignant lung lesions. Am J Roentgenol 1985;144:281–288. Westcott JL, Rao N, Colley DP. Transthoracic needle biopsy of small pulmonary nodules. Radiology 1997;202:97–103. Li H, Boiselle PM, Shepard JO, Trotman-Dickenson B, McLoud TC. Diagnostic accuracy and safety of CT-guided percutaneous needle aspiration of the lung: comparison of small and large pulmonary nodules. AJR Am J Roentgenol 1997;167:105–109. Goldberg-Kahn B, Healy JC, Bishop JW. The cost of diagnosis: a comparison of four different strategies in the workup of solitary radiographic lung lesions. Chest 1997;111:870–876. Ramser ER, Beamis JF. Laser bronchoscopy. Clin Chest Med 1995;16:415–426. Colt HG. Laser bronchoscopy. Chest Surg Clin N Am 1996;6:277–291. Dumon JF, Reboud E, Garbe L, Aucomte F, Merrick B. Treatment of tracheobronchial lesions by laser photoresection. Chest 1982;81:278–284. Cavaliere S, Venuta F, Foccoli P, Toninelli C, LaFace B. Endoscopic treatment of malignant airway obstruction in 2008 patients. Chest 1996;110:1536–1542. Mehta AC, Khan SU. How I do it: Nd:YAG laser photoresection through a flexible bronchoscope. J Bronchol 1997;1:468–472. Jackson R. Basic principles of electrosurgery: A review. Can J Surg 1970;13:354–361. Barlow DR. Endoscopic application of electrosurgery: A review of the basic principles. Gastrointest Endosc 1982;28:73–78. Hooper RG, Jackson FN. Endobronchial electrocautery. Chest 1985;87:712–714. Pedersen U, Kristensen S, Illum P. Palliative resection with high frequency cutting loop in malignant tracheobronchial disease. J Bronchol 1994;1:23–25. Sutedja T, van Boxem TJ, Schramel FM, v Felius C, Postmus PE. Endobronchial electrocautery is an excellent alternative for Nd-YAG laser to treat airway tumors. J Bronchol 1997;4:101–105. Van Boxem T, Venmans VJ, Schramel FM, et al. Radiographically occult lung cancer treated with fibreoptic bronchoscopic electrocautery: a pilot study of a simple and inexpensive technique. Eur Respir J 1998;11:169–172. Reichle G, Freitag L, Kullmann H-J, Prenzel R, Macha H-N, Farin G. Argon plasma coagulation in bronchology: A new method - Alternative or complementary. J Bronchol 2000;7:109–117. Mathur PN, Wolf KM, Busk MF, Briete WM, Datzman M. Fiberoptic bronchoscopic cryotherapy in the management of tracheobronchial obstruction. Chest 1996;110:718–723. Homasson JP, Renault P, Angebault M, Bonniot JP, Bell NJ. Bronchoscopic cryotherapy for airway strictures caused by tumors. Chest 1986;90:159–164. Maiwand MO. Cryotherapy for advanced carcinoma of the trachea and bronchi. BMJ 1986;293:181–182. Vergnon JM, Schmitt T, Alamartine E, Barthelemy JC, Fournel P, Emonot A. Initial combined cryotherapy and irradiation for unresectable non-small lung cancer. Chest 1992;102:1436. Dumon JF. A dedicated tracheobronchial stent. Chest 1990;97:328–332. Freitag L, Eicker K, Donovan TJ, Dimov D. Mechanical properties of airway stents. J Bronchol 1995;2:270–278. Freitag L, Eicker R, Linz B, Greschuchna D. Theoretical and experimental basis for the development of a dynamic airway stent. Eur Respir J 1994;7:2038–2045. Bolliger CT, Probst R, Tschopp K, Solèr M, Perruchoud AP. Silicone stents in the management of inoperable tracheobronchial stenoses. Indications and limitations. Chest 1993;104:1653–1659. Dasgupta A, Heights C, Dolmatch BL, Abi-Saleh WJ, Mathur PN, Mehta AC. Self-expandable metallic airway stent insertion employing flexible bronchoscopy: preliminary outcome. Chest 1998;114:106–109. Bolliger CT. Airway stents. Sem Respir Crit Care Med 1997;18:563–570. Speiser B, Spratling I. Remote afterloading brachytherapy for the local control of endobronchial carcinoma. Int J Radiat Oncol Biol Phys 1993;25:579–587. Macha HN, Wahlers B, Reichle C, von Zwehl D. Endobronchial radiation therapy for obstructing malignancies: Ten years' experience with iridium-192 high-dose radiation brachytherapy afterloading technique in 365 patients. Lung 1995;173:271–280. Sutedja G, Baris G, van Zandwijk N, Postmus PE. High-dose rate brachytherapy has a curative potential in patients with intraluminal squamous cell lung cancer. Respiration 1993;61:167–168. Saito M, Yokoyama A, Kurita Y, Uematsu T, Miyao H, Fuji-mori K. Treatment of roentgenographically occult endobronchial carcinoma with external beam radiotherapy and intraluminal low dose rate brachytherapy. Int J Radiat Oncol Biol Phys 1996;34:1029–1035. Shea JM, Allen RP, Tharratt RS, Chan AL, Siefkin AD. Survival of patients undergoing Nd:YAG laser therapy compared with Nd:YAG laser therapy and brachytherapy for malignant airway disease. Chest 1993;103:1028–1031. Yu M, Edell ES. Endobronchial brachytherapy. Semin Respir Crit Care Med 1997;18:555–561. Fischer R, Huber RM. Endoluminal brachytherapy in central lung cancer In: Bolliger CT, Mathur PN, editors. Interventional Bronchoscopy. Progress in Respiratory Research Vol. 30: Basel, Karger, 2000; pp. 146–158. Cortese DS, Kinsey JH. Endoscopic management of lung cancer with hematoporphyrin derivative phototherapy. Mayo Clin Proc 1982;57:543–547. Hayata Y, Kato H, Konaka C, et al. Photodynamic therapy in early stage lung cancer. Lung Cancer 1993;9:287–294. Lam S, Muller NL, Miller RR, et al. Predicting the response of obstructive endobronchial tumors to photodynamic therapy. Cancer 1986;58:2298–2306. Dougherty TJ. Photosensitizer: Therapy and detection of malignant tumors. Photochem Photobiol 1987;45:874–889. McCaughan JS Jr, Hawley PC, Bethel BH, Walker J. Photodynamic therapy of endobronchial malignancies. Cancer 1988;62:691–701. Edell ES, Cortese DA. Bronchoscopic phototherapy with hematoporphyrin derivative for treatment of localized bronchogenic carcinoma: A 5-year experience. Mayo Clin Proc 1987;62:8–14. Sutedja TG, Postumus PE. Photodynamic therapy in lung cancer. A review. Photochem Photobiol 1996;36:199–204. Ciaglia P, Graniero KD. Percutaneous dilatational tracheotomy. Outcome and long-term follow up. Chest 1992;101:464–467. Schachner A, Ovil Y, Sidi J, Rogev M, Heilbronn Y, Levy MJ. Percutaneous tracheotomy: A new method. Crit Care Med 1989;17:1052–1056. Friedman Y. Indications, timing, techniques, and complications of tracheotomy in the critically ill patient. Curr Opin Crit Care 1996;2:47–53. Hazard P, Jones C, Benitone J. Comparative clinical trial of standard operative tracheotomy with percutaneous tracheotomy. Crit Care Med 1991;19:1018–1024. Griggs WM, Worthley LI, Gilligan JE, Thomas PD, Myburg JA. A simple percutaneous tracheostomy technique. Surg Gynecol Obstet 1990;170:543–545. Christopher KL, Spofford BT, Brannin PK, Petty TL. Transtracheal oxygen therapy for refractory hypoxemia. JAMA 1986;256:494–497. O'Donohue WJ. Effect of oxygen therapy on increasing arterial oxygen tension in hypoxemic patients with stable chronic obstructive pulmonary disease while breathing ambient air. Chest 1991;100:968–972. Tiep BL, Christopher KL, Spofford BT, Goodman JR, Worley PD, Macy SL. Pulsed nasal and transtracheal oxygen delivery. Chest 1990;97:364–368. Benditt J, Pollock M, Roa J, Celli B. Transtracheal delivery of gas decreases the oxygen cost of breathing. Am Rev Respir Dis 1993;147:1207–1210. Wesmiller SW, Hoffman LA, Sciurba FC, Ferson PF, Johnson JT, Dauber JH. Exercise tolerance during nasal cannula and transtracheal oxygen delivery. Am Rev Respir Dis 1990;141:789–791. Orvidas LJ, Kasperbauer JL, Staats BA, Olsen KD. Long-term clinical experience with transtracheal catheters. Mayo Clin Proc 1998;73:739–744. van Boxem T, Muller M, Venmans B, Postmus P, Sutedja T. Nd-YAG laser vs bronchoscopic electrocautery for palliation of symptomatic airway obstruction. Chest 1999;116:1108–1112. Noppen M, Meysman M, Claes I, D'Haese J, Vincken W. Screw-thread vs Dumon endoprosthesis in the management of tracheal stenosis. Chest 1999;115:532–535. Bolliger CT. Multimodality treatment of advanced pulmonary malignancies In: Bolliger CT, Mathur PN, editors. Interventional Bronchoscopy. Progress in Respiratory Research Vol 30: Basel, Karger, 2000; pp. 187–196. Huber RM, Fischer R, Hautmann H, Pollinger B, Haeussinger K, Wendt T. Does additional brachytherapy improve the effect of external radiation? A prospective randomized study in central lung tumors. Int J Radiat Oncol Biol Phys 1997;38:533–540. Anonymous. Section on Respiratory Endoscopy of the German Society of Pulmonology (endorsed by Respiratory Endoscopy Section of Pulmonology Sections of Austria, Hungary, and Switzerland). Recommendations for Bronchoscopic Treatment of Tracheobronchial Occlusions, Stenoses, and Mural Malignant Tumors. J Bronchol 2000;7:133–138. Mehta M, Shahabi S, Jarjour N, Steinmetz M, Kubsad S. Effect of endobronchial radiation therapy on malignant bronchial obstruction. Chest 1990;97:662–665. Gelb AF, Zamel N, Colchen A, et al. Physiologic studies of tracheobronchial stents in airway obstruction. Am Rev Respir Dis 1992;146:1088–1090. Macha HN, Becker KO, Kemmer HP. Pattern of failure and survival in endobronchial laser resection. A matched pair study. Chest 1994;105:1668–1672. Colt HG. Functional evaluation before and after interventional bronchoscopy In: Bolliger CT, Mathur PN, editors. Interventional Bronchoscopy. Progress in Respiratory Research Vol 30: Basel, Karger, 2000; pp. 55–64.